The Mosquito Lite 800 is an affordable, versatile stand in silver with sleek black endcaps. 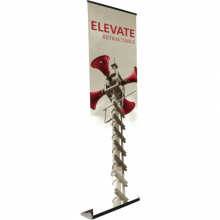 This stand is compact and easy to use with a snap rail and bungee pole. 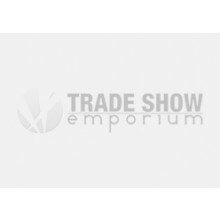 It is available for purchase in bulk packs of six or individually. The Mosquito 1200 is an affordable, versatile stand in silver with sleek black endcaps. 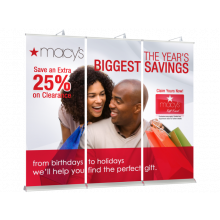 With three base widths to choose from, including one that is five feet wide, this product's usability goes from banner stand to backwall. The Mosquito 1500 is an affordable, versatile stand in silver with sleek black endcaps. 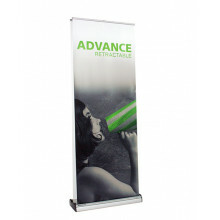 With a base width of five feet and overall height of 82.87", this product's usability goes from banner stand to backwall. 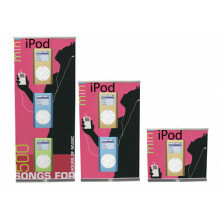 The Extra Tall Mosquito is an affordable, versatile stand in silver with sleek black endcaps. With a heavy-duty aluminum base and a variety of height options up to 10', the Giant Mosquito provides many options to choose from.